The Angels Spirit of Excellence is embodied by someone who is dedicated to the pursuit of excellence in stroke care for their hospitals and patients. Someone who serves as a mentor for other hospitals or individuals within their greater community. Who takes part in the initiative using the tools and resources made available to them and is committed to doing whatever it takes to give stroke patients a second chance at life. After being privileged to spend some time in the Karolinska Institute in Stockholm, I returned home to my hospital in Siena, Tuscany. Motivated and inspired by the new perspective that I had gained, I began my journey of change by gathering my colleagues together to share my experiences and to inspire them by what I had experienced in Stockholm. I felt it was my responsibility to lead and encourage my team to implement the changes that I knew would create an efficient stroke care pathway. With the support of Prof Martini and after many experience sharing sessions we managed to align the team. Once the team had aligned, we decided to rewrite the internal hospital stroke pathway. With the help of our hospital’s agile project team we identified points of improvement with which to reduce our door-to-treatment times. Prof Martini and I not only wanted to make changes within our own hospital, but wanted to bring about changes within the whole regional referral network to ensure it functioned more efficiently and effectively. Our initial changes resulted in large reductions in treatment times and even though we were not perfect yet we felt we had achieved a lot. I guess as it is with most big endeavors, people start with huge amounts of enthusiasm and excitement but without support this begins to wear off and one begins to feel tired and demotivated. Because the project wasn’t the main focus any longer, we lost momentum and started losing some of the gains that we had initially made in the door to treatment times. Prof Martini and I almost felt like we were fighting the good fight alone, and even I was slowly getting a bit demotivated. It gets quite exhausting always needing to encourage others to keep implementing all of the changes. It was at this time that I was introduced to The Angels Initiative by local Angel, Lorenza Spagnuolo. We quickly realised that the support offered by Angels was the boost that we needed. Lorenza made our team feel important, almost like we were the “Angels” within our region. All of a sudden it felt like we were a part of a movement, something bigger than ourselves. Since joining the Angels Initiative we have again updated our treatment processes and further improved our treatment times. 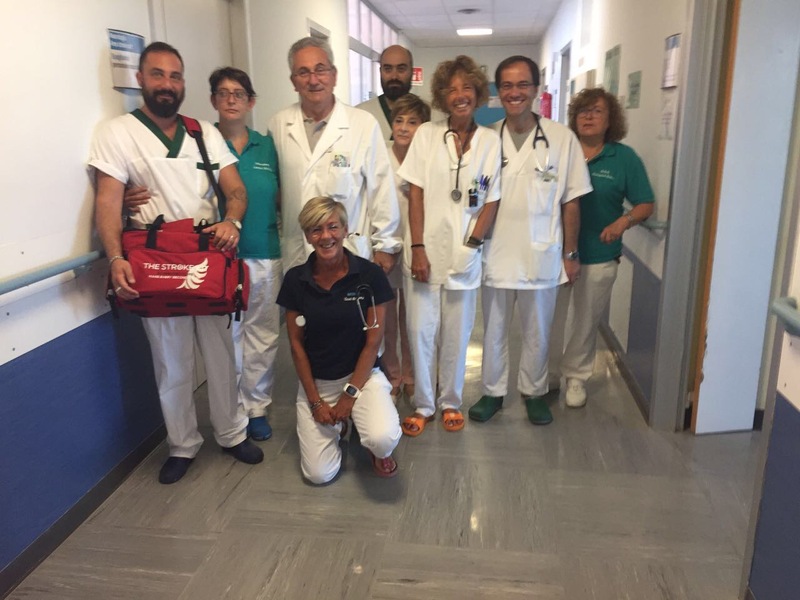 We have had 3 editions of full day regional multidisciplinary workshops, attended by more than 150 professionals including EMS staff, nurses and doctors from Siena and our referring hospitals. The workshops even included virtual patient simulation training using the body interact software. Some of the cases were pretty tricky but I was really proud of how engaged and professionally everyone took part. Furthermore we are now in the process of setting up a dummy patient simulation within our hospital to test and reinforce our hyper acute pathway and see if we can find ways to further optimise our treatment times. Finally, through Lorenza, we are currently in the process of co-ordinating the installation of the e-aspects software for all surrounding hospitals to improve the quality of referrals within the region. Lorenza has reminded us of how significant our daily work is and how impactful we have been. We now live by the Angels slogan: Giving Life a Chance.